Most koi parasites are not visible to the naked eye. In order to correctly identify any koi parasites you will need the use of a microscope with a built in light and a magnification of a minimum of 100 times to a maximum of 400 times. These are easy to use and are an essential piece of equipment for any serious koi-keeper. You can purchase these from Dock Koi-please phone for more details. To determine if your koi are infested with any parasites, you will need to take a scrape of mucous. This involves carefully using a microscope slide to remove a small quantity of mucous from one of your koi. The mucous is then sandwiched between the slide and the cover slip with a drop of pond water added and inspected through the microscope. If you suspect you have a koi parasite problem, skin scrapes need only be taken from two or three koi, and if parasites are found, it would be safe to assume that all the koi are infested by the parasite and therefore the entire pond will need to be treated. Before any parasite treatment is added to your pond water, it is essential that you know the exact volume of water that your pond contains including all filter areas and what the current temperature is as this could affect the treatment too. Make sure that there is no salt added to your pond water as with some treatments this could be detrimental to your koi! The maximum limit of salt in your pondwater would be 0.1% solution to allow safe treatment of your koi but ideally none is preferable. Parasite treatments will lower the dissolved oxygen levels in your pond so we recommend adding additional aeration when using any chemicals in your koi pond. You must also switch off any ultra violet sterilisers/clarifiers and ozone equipment during the treatment process. WHITE SPOT usually detected with the aid of a microscope-can be easily seen at 100 times magnification. Symptons include flashing in the early stages of infestation, small white pin-prick size spots often found on head and fins, followed by heavy mucous and subsequent death if left untreated. Treatments include King British WS3 full strength every 48 hours until cleared, or Malachite and Formalin Premix once every four days in pond temperatures above 63 degrees or every 7 days in pond temperatures above 50 degrees for a maximum of 3 treatments. TRICHODENA can easily be identified under a microscope using 100 times magnification. It is usually seen moving very quickly and spinning around under the cover slip. Symptons include tiny red veins appearing on white skin, heavy mucous and lethargy. Eradication of Trichodena is usually only effective by using Potassium Permanganate to your pond at the rate of 1.5gm per 220gallons of pond water. Addition of this greatly reduces the oxygen content of your pond water and therefore it is essential that you add additional aeration for the duration of the treatment. Care should always be taken when using this product! An alternative product to use is Medizin P which is a 3-dose treatment to your pond water. COSTIA is very small and can just be seen under 100 times magnification-400 times is better. You usually see it in the water surrounding the mucous and it is very fast moving. Costia can affect the skin and gills of your koi and left untreated be fatal. Symptons can include excess mucous, lethargy, and often hanging head upwards in a quiet corner of the pond. When heavily infested extremities of fins turn greyish white due to lack of oxygen supply to the bloodstream. Followed by eventual death. Any recognised parasitic treatment will eradicate costia. Malachite/Formalin premix being the most popular. CHILODONELLA can easily be seen under the microscope at 100 times magnification. It is oval in shape and an efficient swimmer and can easily spread from koi to koi. Symptons of infestation are similar to that of Costia and the treatment is the same. SKIN/GILL FLUKES both of these parasites are worm like in appearance and they attach themselves to koi by hooks which can easily be identified under a microscope. It lives and feeds on the mucous, skin and blood of the koi. 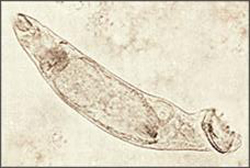 The skin fluke bears live young and you can often see the hooks of the young fluke in the abdomen of the adult. The gill fluke is an egg-layer and can lay up to two dozen eggs per hour. Common symptons are lethargy, hanging in the water and flashing to dislodge parasites. We have found that the best treatment is Fluke-M by Kusuri Products. It appears to be the most effective treatment on the market at the moment as flukes have become resilient to other medications.